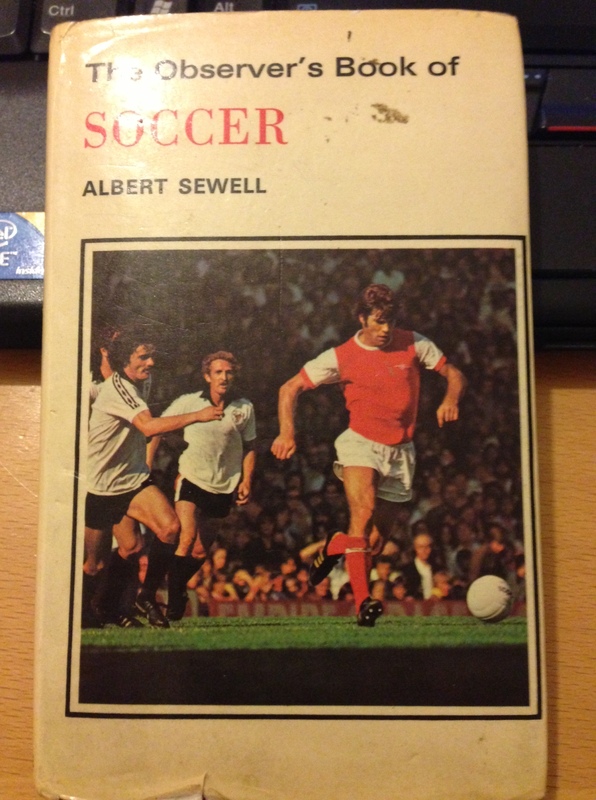 Legendary football statistician Albert Sewell penned the Observer’s Book of Soccer, a suitably pocket-rocketesque contribution to the canon of Observer’s books. I picked up a copy of the fifth edition, with powerhouse striker Malcolm ‘Supermac’ Macdonald in his Arsenal pomp gracing the cover, on holiday in Lyme Regis from the wonderful Sanctuary Bookshop. More on Lyme to come soon. 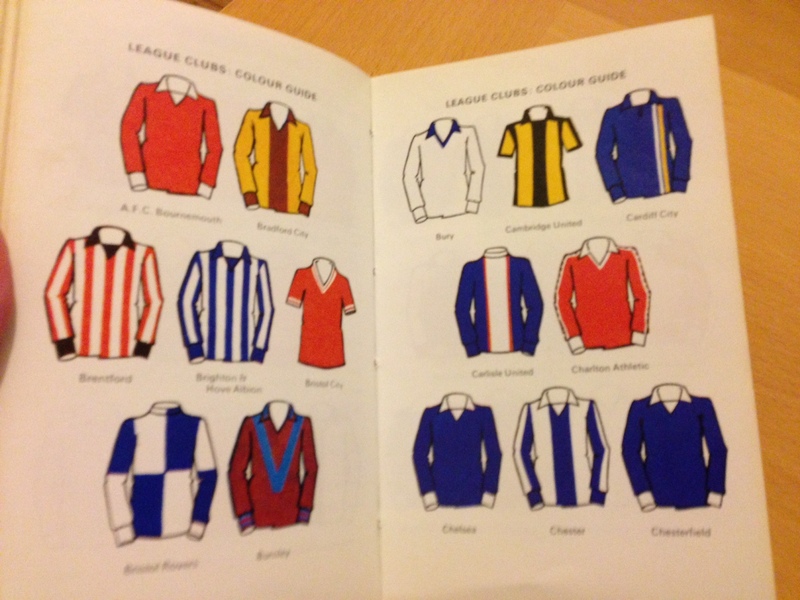 The inside is a collection of facts and figures from around the world of football in the late seventies and includes a wonderful colour insert detailing the kits of the league clubs of the day. Sorry for the grainy pictures but you should get the idea. 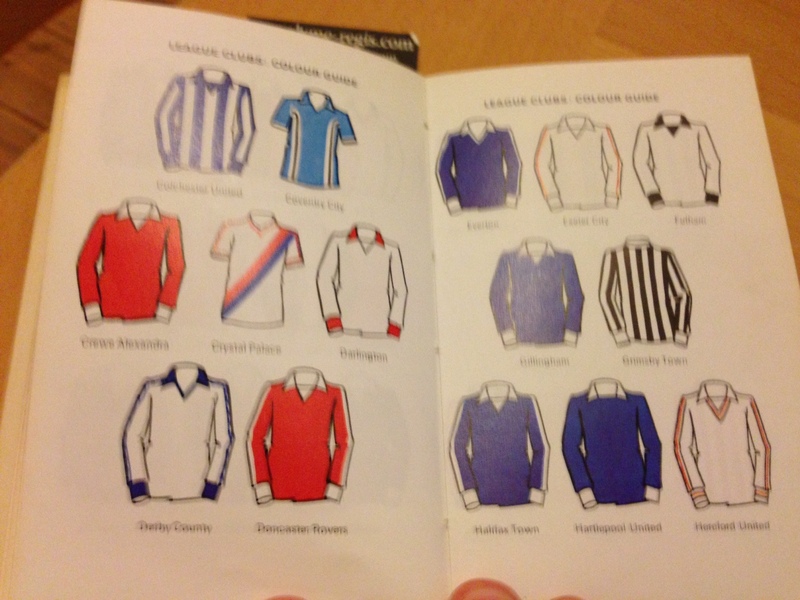 The highlights of this retro kit bonanza start immediately – note Blackburn Rovers’ harlequin collar and neck line. 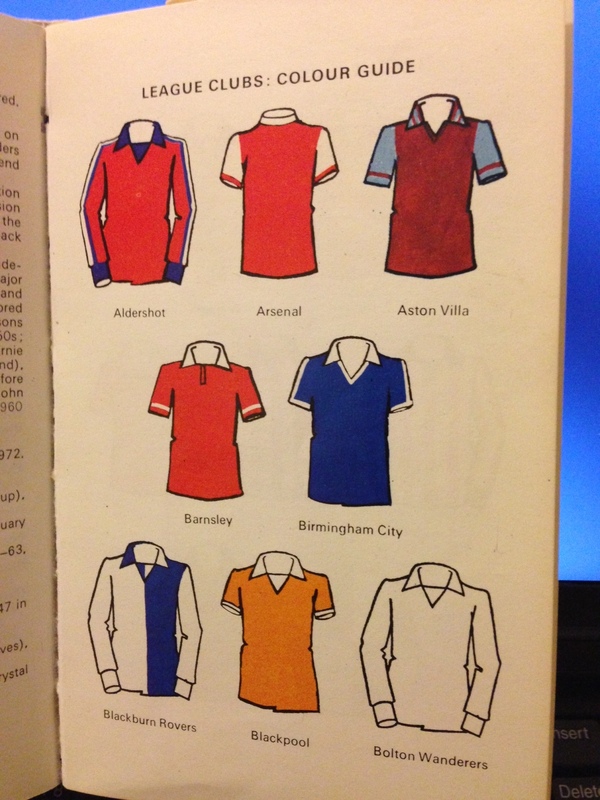 Burnley’s blue chevron must have made many a Lancastrian lass’ heart skip a beat on an otherwise drab Turf Moor afternoon. 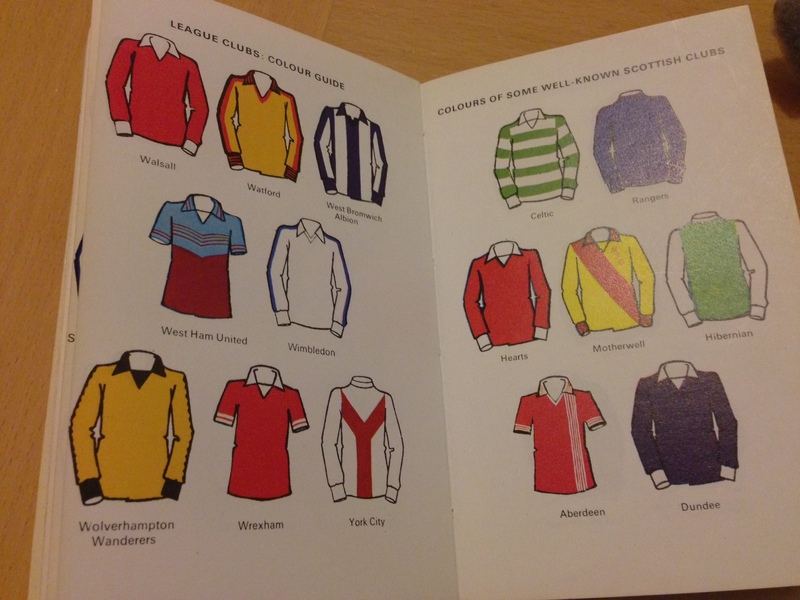 And surely Cardiff would have graced the top flight a little sooner had they stuck to the natty number above rather than cashed in and changed colours altogether. In fairness, the colour change appears to be helping somewhat at the time of writing. Coventry’s motoring heritage is reflected in their dazzling Autobahn-esque sky blue special. 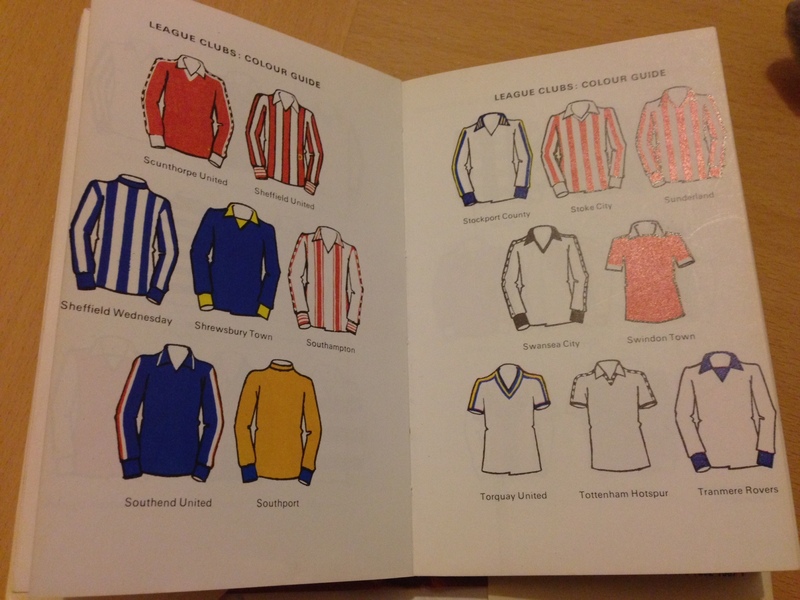 Of all the kits here only Middlesborough are still rocking a round neck. Ayresome. 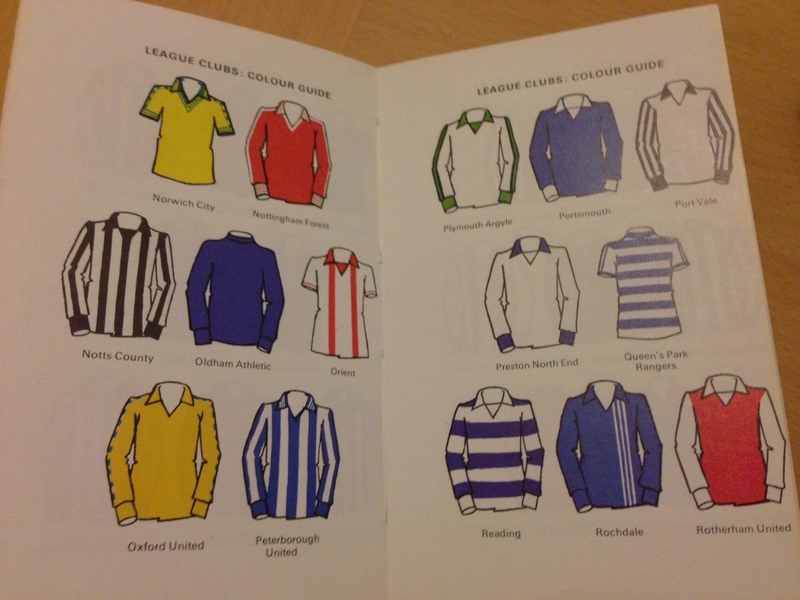 Port Vale’s sleeves are quite breathtaking. Was there a short-sleeve version? This was the Tottenham kit worn by a young Glenn Hoddle. They didn;’t win much then either but they looked good. West Ham have surely never looked better. 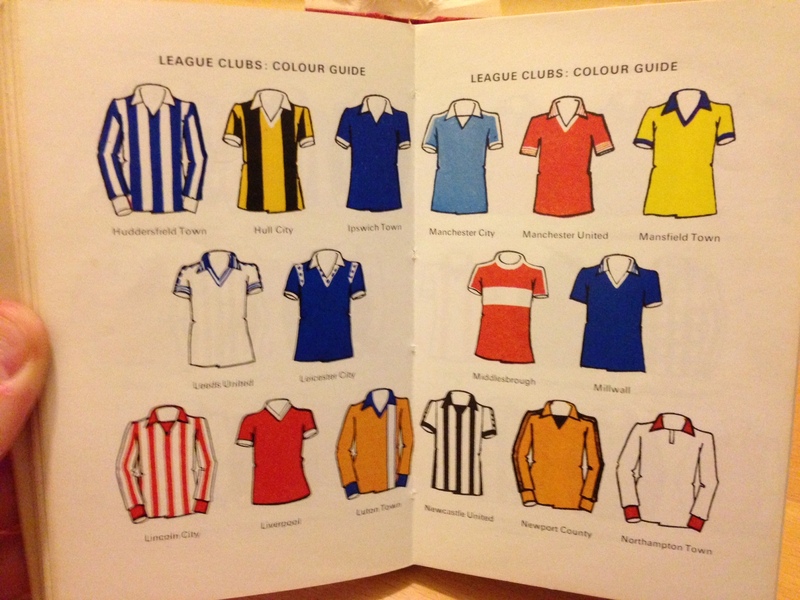 As for York City, Y not? This page deals with goalkeepers and international kits. The best ever Welsh kit, bar none. 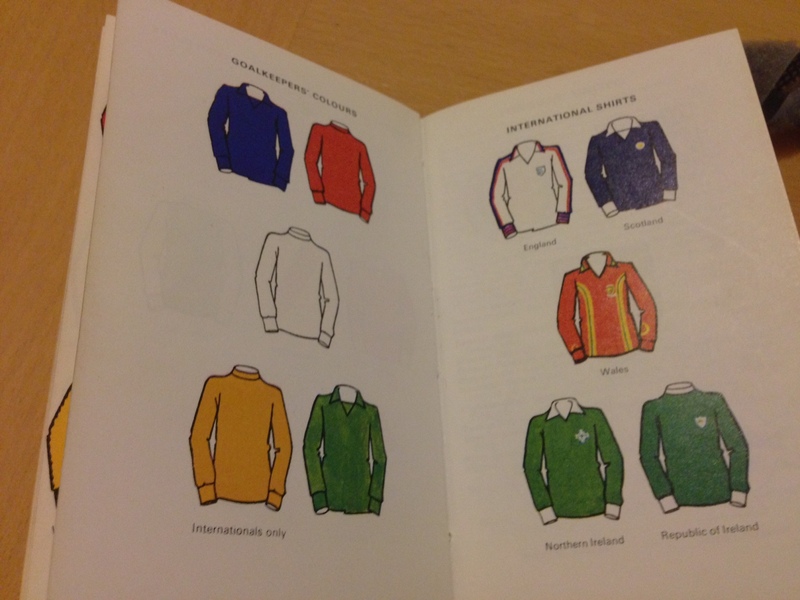 And the yellow goalkeepers top severely marked ‘internationals only’. You often find this and other ‘Observer’s’ books knocking around for a few quid and there’s always something new to learn in them. Highly recommended. 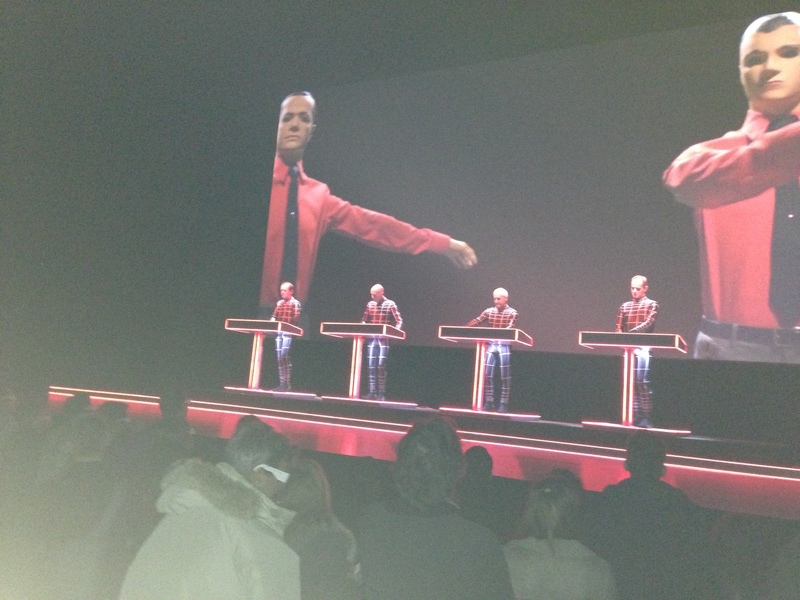 Here are a few photos from Kraftwerk’s show at the Tate Modern that I was lucky enough to go to last night. They played Radioactivity pretty much in full, plus plenty of their best-known songs to a light and 3D effects show that made for one of the most astonishing concerts I can remember. 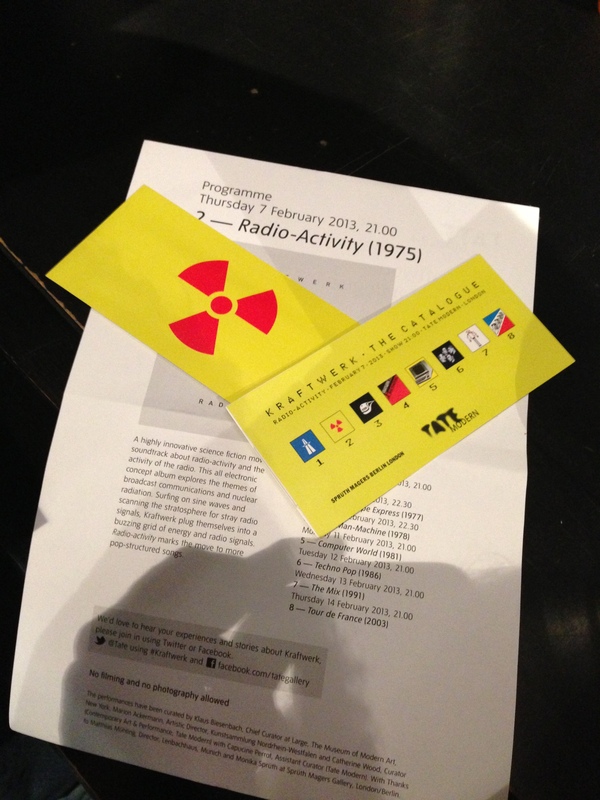 On entering the Tate Modern we were given wristbands, 3D glasses and an information sheet explaining the band’s importance and how the show would work. It said they’d be on at 9pm. They arrived at 9pm on the dot. The show took place in the middle of the Turbine Hall. This is an immense space and less than half of it was used. The stage was at the foot of the slope on the western side of the hall. 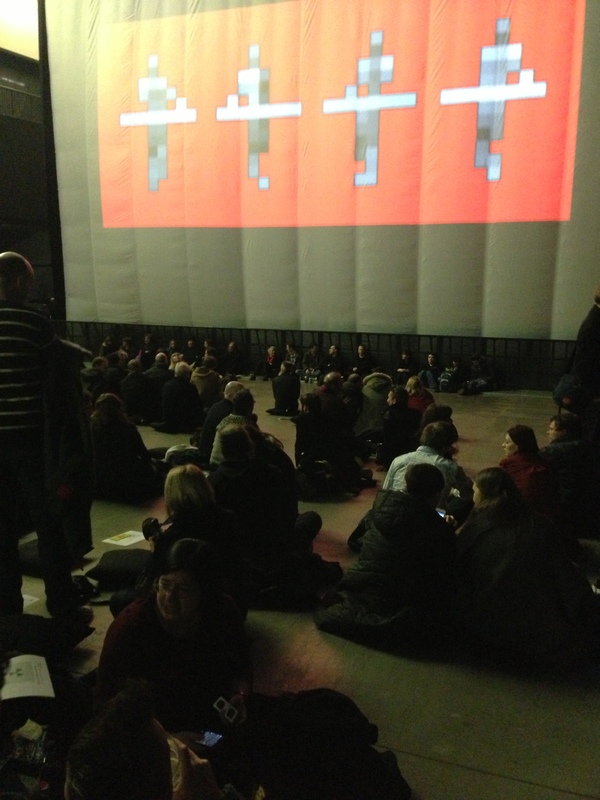 Cushions were issued but everyone stood up and danced when Kraftwerk came on. The sonic accompaniment to the backdrop above was typical distorted vocal sounds, like the first sound of ‘Ohm sweet ohm’. These got more frequent and louder as 9pm approached. The first song was We Are The Robots, accompanied by amazing 3D effects – words and symbols flying over the heads of the crowd. We were right at the front. Only 1000 people were in the venue (someone else said it was 700, I’m not sure) and there was lots of space at the front. Ralf Hütter, the only original member of the group still performing, is on the far left. We’d been promised a Gesamtkunstwerk (full artistic synthesis), but the two-hour set felt more like a regular concert than I was probably expecting. 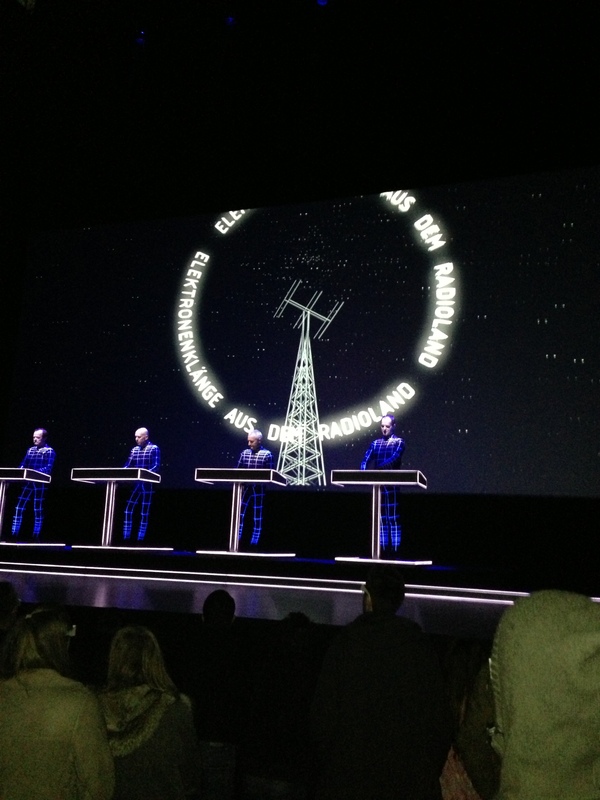 Contrary to the image, the four chaps on stage danced about a bit – though they never left their control panels. Hütter sang the vocals on several songs which I also wasn’t expecting. 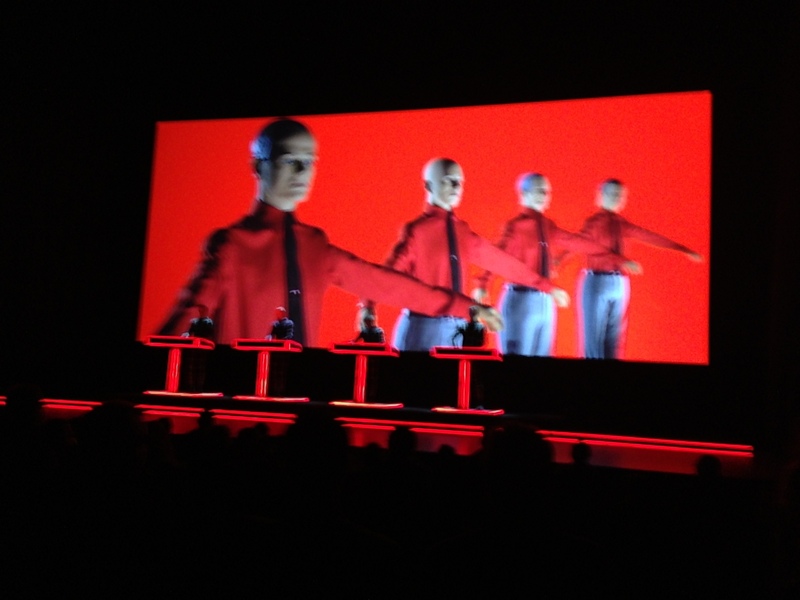 There’s a lot of humour in Kraftwerk and it was hugely fun. Friends who had seen them before felt that hearing more obscure sections of Radioactivity was the real treat of the evening. This is the visual from Radioland . 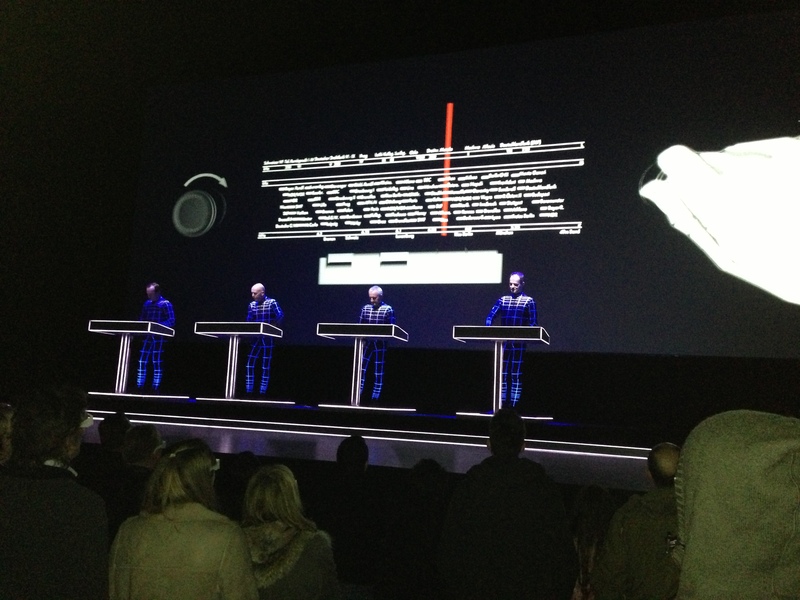 Bonus points for Kraftwerk-enthusiasm go to the man in a knitted Man Machine jumper. From Russia, he told us, but bought in Sweden for him by a friend who was a ‘moderate’ Kraftwerk fan. I figured I would not get too high up his scale of mania for the band as I did not own a pair of Kraftwerk socks. At the end of a hugely enjoyable set the band left the stage one by one, the sound reducing by a clear element at each point of departure. 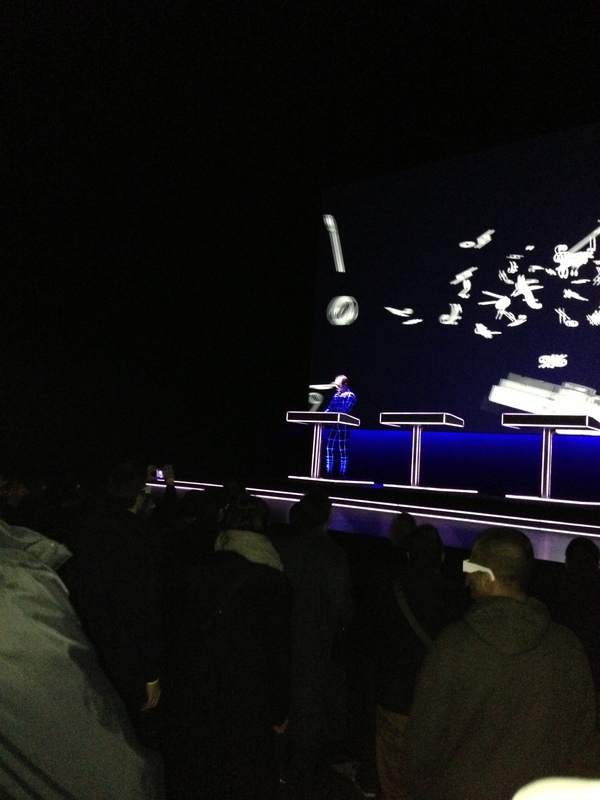 Hütter was left on his own for a minute, then the electro-pioneer exited the stage.